With spots like BlueIguana Cantina, Guy's Burger Joint and Bonsai Sushi, Carnival Pride has more dining offerings than just a main dining room or buffet. What's better, the menu items at these eateries are fresh and made to order. But while these alternative restaurants stayed busy throughout our seven-night cruise, the tried-and-true favorites of the main dining room and the buffet on the Lido deck held their own, attracting a following. Overall, the food quality was high everywhere on Pride, and the crew kept everyone moving so wait times were minimal. Breakfast, lunch and dinner are served in the buffet restaurant, with breakfast and dinner available in the main dining room, as well as in some of the alternative restaurants, though hours vary. BlueIguana Cantina, for instance, serves breakfast and lunch, while Guy's Burger only serves lunch. A limited room service menu is available 24 hours a day except on debarkation day. Passengers with dietary restrictions should discuss their limitations with the cruise line prior to sailing; if that's not possible, they should speak with the maitre d' or wait staff before any meal so adjustments can be made. Normandie Restaurant (Decks 2 and 3): Also called the main dining room, Normandie Restaurant is open for breakfast and dinner. On sea days, passengers can enjoy a sea day brunch from 8:30 a.m. to 1 p.m. instead of breakfast. Menu items include eggs Benedict, steak and eggs, and pancakes. On port days, breakfast is available from 7 to 9 a.m. and features eggs, breakfast meats, pastries and more. For dinner, cruisers can choose from the flexible Your Time Dining, which is available from 5:45 to 9:30 p.m. in the upstairs section of the restaurant, while the set time dining -- early (6 p.m.) and late (8:15 p.m.) -- is downstairs. Regardless of which style of dining you choose, all dinner menus are the same -- either Carnival's "American Table" menu on most nights or "American Feast" menu on formal nights. The "American Table" menus include appetizers and entrees, but also feature a "rare find" item for adventurous eaters or "port of call" items related to ports on the current itinerary. For instance, braised rabbit or escargot may join such standard appetizers as shrimp cocktail, while sea bass fillet with plantain crust was offered as a Grand Turk entree. Also on the "American Table" menu is a "From the Grill" section, which usually features a fish dish, flat iron steak, roasted chicken and a pork chop, all available with optional sauces like barbecue and wild mushroom. For an additional $20 fee, passengers can order a "Steakhouse Selection" such as a filet mignon and New York strip steak. The "American Feast" menus, which are only offered on the cruise's optional formal night, include appetizers and entrees with a mix of regular and rotating items. For instance, shrimp cocktail is always on the menu while the soups rotate. The dessert menu every night features standards like Carnival's chocolate melting cake or tropical fruit plate as well as specialties like buttered popcorn pot de creme and chocolate panna cotta. A kids menu is also available and contains chicken nuggets, mac 'n' cheese, and other popular kid items. Mermaid's Grille Lido Restaurant (Deck 9): Decorated in blues and greens, this buffet-style restaurant serves breakfast, lunch and dinner via a variety of food stations spread throughout the space. Breakfast foods include breakfast meats, pancakes, eggs, cereal, fruit and yogurt. A made-to-order omelet station also is available and during breakfast hours, the beverage fountains serve up orange cocktail, apple juice and an orange/passion fruit/guava cocktail. Lunch and dinner offers up a variety of options. For instance, you'll find country-specific cuisine at the "Chef's Choice" bar -- think American, Caribbean, Italian, French and more. At the "Comfort Kitchen" station, menu items range from pot roast and baked chicken to mac 'n' cheese and casseroles. An extensive salad bar is always available with greens, veggies, toppings and, premade salads like coleslaw and potato salad. The "Sweet Spot" features a variety of desserts, like cookies, cakes, pies, tarts and more. Beverage stations are stocked with lemonade, iced tea, coffee, hot tea and water. From 11:30 p.m. to 1 a.m., late-night snacks like hot dogs and chicken fingers are available. Soft serve ice cream is available 24 hours a day. Parts of Mermaid's Grille may close at certain times during the day to switch over from breakfast to lunch and from lunch to dinner service, but at least one station remains open at all times. Within Mermaid's Grille, there are several "individual" restaurants open at various times of the day. When it's lunchtime, head to Chopsticks to sample Chinese food such as vegetable fried rice, kung pao chicken, and sweet and sour pork. Open for lunch and dinner, the Carnival Deli makes fresh, made-to-order hot and cold sandwiches like a turkey wrap, pastrami on rye, and grilled ham and cheese. Pizza Pirate (Deck 9): Open 24 hours a day, Pizza Pirate serves up five different types of pizza as well as Caesar salad (upon request). Pizzas include pepperoni, mushroom, margherita, four cheese and prosciutto. This restaurant stays busy throughout the day, and there can be waits of 15 minutes or so as passengers wait for fresh pizzas to bake. BlueIguana Cantina (Deck 9): A hot spot at lunch, this Mexican eatery offers made-to-order tacos, burritos and salads with beef, chicken or shrimp, plus a whole host of additions such as black beans, corn and guacamole. In addition, there's a toppings bar with salsa, sour cream, tomatoes and more. Also open for breakfast, this restaurant offers up custom breakfast burritos. Room Service: Pride offers 24-hour room service, including a continental breakfast from 5 to 10 a.m. that features cereals, breads, juices and coffee. A limited lunch and dinner menu is available from 6 a.m. to 10 p.m. and includes salads, sandwiches and desserts. While juices, tea (hot and cold), coffee, milk and hot chocolate are complimentary, soft drinks and beer will incur regular bar prices. No room service is offered on debarkation day. 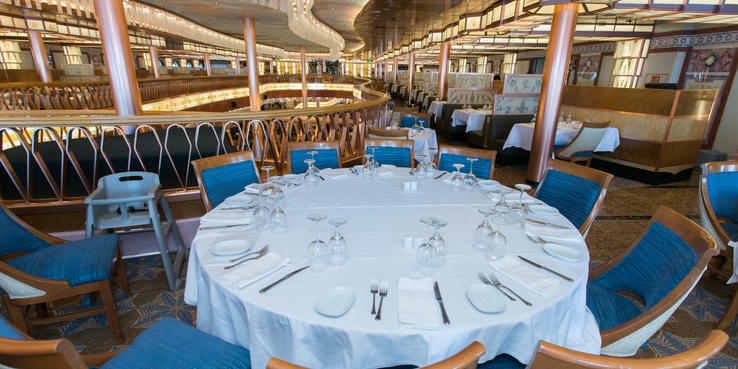 The Chef's Table (Deck 2); $75 per person: Available for dinner once or twice per cruise (depending on demand), this multicourse meal begins with a private tour of the galley with the master executive chef. Reservations are required. The Piazza Cafe (Deck 2); a la carte pricing: Usually open all day, this coffee and pastry bar features a menu of specialty coffee drinks, milkshakes, cookies, cakes and chocolate-covered strawberries. Bonsai Sushi (Deck 2); a la carte pricing: This popular Fun Ship 2.0 dining spot features a menu of appetizers, soup, salads, sashimi, bento boxes and sushi rolls. Japanese beer and sake also are available. The restaurant is open for lunch and dinner on sea days and dinner only on port days. David's Steakhouse (Deck 10); $38 per person: Open 5:30 to 9:30 p.m., this specialty restaurant takes elegant dining on Carnival to a new level. Above a replica of Michelangelo's David, a red sunroof (actually a part of Carnival's famous red funnel) high above the restaurant casts a warm glow over diners. With a menu of appetizers, salads, entrees and desserts, choices range from ahi tuna tartare, lobster bisque and Caesar salad to filet mignon, Maine lobster ravioli and grilled lamb chops. Desserts include cheesecake, a chocolate sampler and fresh fruit. Reservations are recommended. Dr. Seuss Green Eggs & Ham Breakfast (Deck 2); $5 per person: You'll find the family-friendly Dr. Seuss Green Eggs & Ham Breakfast in the main dining room. It includes Dr. Seuss-themed foods along with character appearances. On our cruise, it was held on the last sea day; reservations are required. Room Service; a la carte: While many room service items are free, Carnival Pride also offers a fee-based menu from 6 a.m. to 10 p.m. that includes hot items such as chicken wings and tenders, fried shrimp and French fries. Items cost between $2 and $6 per item. From 10 p.m. to 6 a.m., the menu expands, adding items like grilled cheese, bacon and tomato sandwich, roast turkey wrap and chicken Caesar salad to the previously mentioned choices.